This just means return all columns. If we have multiple tables, a Select star will grab all columns from all tables, for example, when joining multiple tables together using the SQL Join clause which is the main subject of this article. Let’s start with the definition. Joining is the process of taking data from multiple tables and putting it into one generated view. 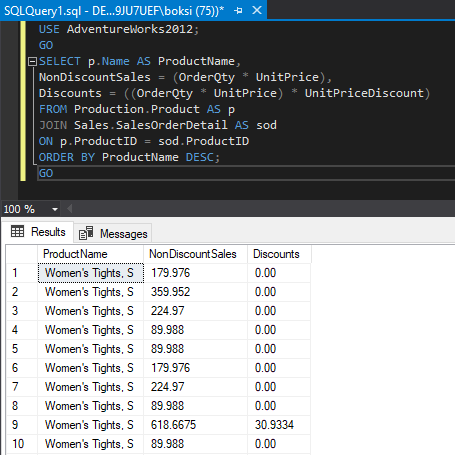 So, an SQL Join clause in a Select statement combines columns from one or more tables in a relational database and returns a set of data. Inner join – this is a default. If we don’t specify a type of join, it’s going to default as the inner join. This means if we are joining two tables on a common column, only return the data that matches on both tables. Left join – This type of join means returns all data on the left-handed table and only the data that matches the left-handed table in a right-handed table. Right join – this type of join is the opposite of the above. It just means return data from the right-handed table and only the data that matches the left-handed table. The result set indicates that 19972 records are returned, and we have a bunch of Nulls under the “BusinessEntityID” column. The rows that have Nulls are people that haven’t made any purchases. So, this was an example of a left join used to create sales sheet in which we absolutely wanted every single purchase whether it has a purchase or not, but we always wanted the records to show. The key difference between the Inner joined and Left join is that we are not losing/missing records. Now, the SQL Join clause with Right joins are the exact opposite of the Left join. They basically do the same thing. Left is right and right is left and the same effect can be rendered by just flipping the tables. Right joins are in no way deprecated, they are just not all too common. For consistency’s sake, it is a common practice to use Left joins instead of Right joins. We’ve covered the three main joins: inner, left, and right join. Those three are the ones that are used most extensively. And even if you’re a newbie in the database world it’s very likely that you’ve come across different types of SQL Joins quite a bit. Left outer join – fetches records if present in the left table. Right outer join – fetches records if present in the right table. Full outer join – fetches records if present in either of the two tables. Cross join – as the name suggests, does [n X m] that joins everything to everything. Like a scenario where we simply list the tables for joining (in the From clause of the Select statement), using commas to separate them. If you just specify Join, then by default it is an Inner join. An Outer join must be Left/Right/Full. You cannot just say Outer join and leave it there. You can drop the Outer keyword and just say Left join, Right join or Full join. I hope the use of Venn diagrams to explain types of join are helpful, but they don’t always quite match the SQL join syntax reality in my testing. Therefore, I highly suggest that you don’t rely on them entirely and to experiment by writing queries and comparing the results.